Multi-hierarchical self-assembly (MHSA) is a key process responsible for the spontaneous formation of many complex structures. However, because of the complexity of the process, the underlying mechanism remains largely unclear. Thus, a deeper understanding of MHSA is required, especially for the preparation of MHSA systems via bottom-up methodologies. We show here, experimentally and theoretically, that the complex-formation MHSA of peptide nanotube films can be controlled solely by manipulating the experimental parameter of humidity. 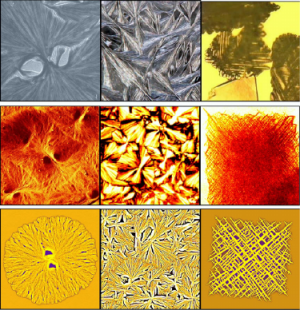 Furthermore, we identify growth-front nucleation (GFN; the formation of new grains at the perimeter) as the physical background for the observed morphological transitions by correlating experimental observations with phase-field modeling of the morphological evolution. Our findings indicate a simple way to control multi-hierarchical morphologies, crucial for the employment of bottom-up techniques in constructing complex structures for practical applications.